The grand opening of the Four Mile Run Farmers and Artisan’s Market was like every other Farmer’s and Artisans market in that fresh produce ruled the day, and specialty foods created instant fans. But for so many, it was the culmination of months of collaboration and reason for celebration. “I’m really impressed with the turnout,” said Councilman Rob Krupicka, on hand for the ribbon cutting ceremony, and was the driving force behind the recent legislation to make healthy food more accessible in Alexandria. "This is a great example of what happens when the community comes together and works on a joint project. This market is the result of vision and volunteers. Nothing else. Its a sure sign of a strong community when it can pull together to create something like this. The new market will make the community stronger and will give all of us greater access to local food and some great arts and crafts." Vendors were still signing up as the ribbon was being cut. Eyvy Alvarado, market manager from nearby Marcella’s Bakery, filled out the forms, set up her stand, and within two hours, sold out of her first batch of baked goods. As did her neighbor Elise Scott of Pearl Fine Teas, who had the good fortune of being the only vendor with iced cold tea on a day when temperatures quickly soared above 90 degrees. Nearby neighbors from Arlandria, Crystal City, Shirlington, Del Ray and Beverley Hills walked, jogged and drove to check out the market, often lingering to enjoy (or, in the case of the area tots, dance to) the music by Curtis Blues. "Mt. Vernon Avenue’s proximity to everywhere, at the entrance to Four Mile Run Park makes this a perfect location for a farmers market,” said Del Ray Resident and former Councilman Justin Wilson as his son and daughter danced and played backup maracas to Curtis Blues. Architects Anonymous, the designers of the proposed green rehab and re-purposing of the former paint store at the park expansion, were highlighted at the community table where they displayed their design plans for the site and solicited feedback from passersby for the proposed colors of the future community building. Across the way, Zelda Wallace of Zelda’s Nova Soul celebrated her own success. Just last year, the former broadcaster with Cox network lost her job of 20 years. With encouragement from her mom, friends and family, she decided to first test out her love of cooking at the Del Ray Market on Saturday, and at the Four Mile Run Market on Sunday. “I always wanted to open a restaurant, but that’s a pretty risky initiative,” Wallace said. “Still, I've always been told people would pay for my salads.” Three hours after the market opened, Zelda’s shrimp salad sold out. Twenty minutes later, so did her cucumber salad. She spent the remaining time taking orders. Many of the vendors did not anticipate such a terrific turnout. The list of vendors joining up in the next couple of weeks include Vera's Bakery, Krishon Chocolates, St Elmo's Coffee Pub, the Dairy Godmother, and Bread and Chocolate. The Dairy Godmother will embrace the Latino culture of the neighborhood with plans to sell paletas (Latin American frozen fruit treats) in coming weeks. With the hot weather here to stay, they are sure to be a huge hit. 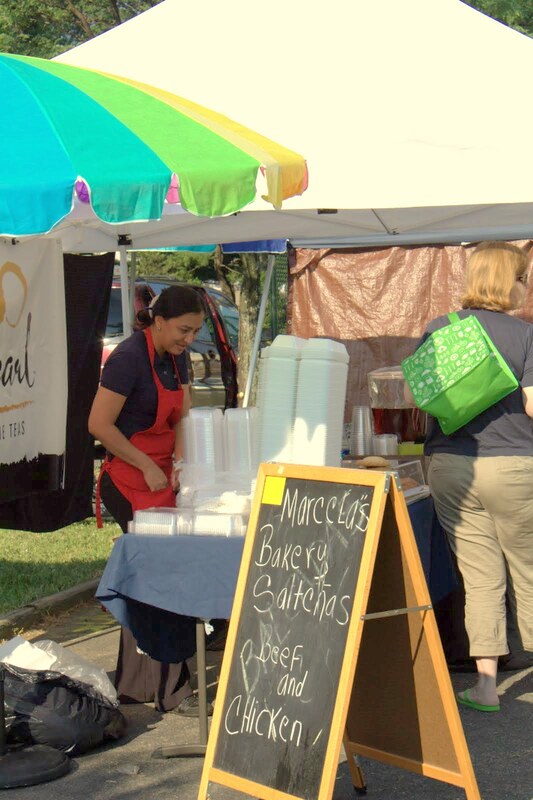 The Four Mile Run Farmers and Artisans Market is open Sundays from 8am until 1pm and runs from April through October at Four Mile Run Park, 4109 Mt Vernon Avenue.